I am on the newest episode of Youngman Brown’s wonderful podcast, Your Creative Push. The importance of your partner understanding your creative needs. Creative postpartum depression that often occurs when we are finished with a project. Why I left the advertising industry. 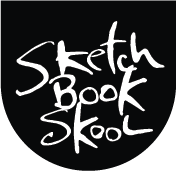 Meeting Koosje Koene and how Sketchbook Skool started. The value in seeing how many different artists make art as well as seeing where they make it. The role that community plays in developing as an artist. The difference in motivation when you are paying for something as opposed to getting it for free. Giving yourself constraints or challenges. What it means to clear space in order to start new things (or finish old things). How I got past imposter syndrome (and my advice for Youngman in getting past his). Next Post Study Hall: Bottoms up! Great to hear this. I’m always looking for Podcasts that have to do with art, music, and creativity. Thanks. I look forward to listening to your interview. I loved the podcast. I’m relatively new to you and have been reading about your losses so I am so happy you found love and marriage again. I’d like to place a vote for the Skool to develop a watercolor class like you use in your books and also for a digital sketching. Like you, I’m using my iPad Pro and loving it. Now over to sign up for a class.